I'm going to secretly work on getting the nao negative for Dec & Jan.
Ok semi-serious. I'm assuming there is something cyclical to the cfs2 outlooks, because the recent members are trending enso neutral positive while the "older" ones were mdt el nino. it can't be as bad as last year... i dont know if i could go another winter of seeing adam posting blowtorch pictures ftl. As soon as you say this, you know he'll be by with some napalm in response. I think it's probably just having to do more with the ICs and the climate models not handling the MJO particularly well. We've seen SSTAs cool across the tropical Pacific over the last 2 weeks due to the MJO being on the other side of the globe (so the atmospheric flow in the EPAC has been anomalously easterly). 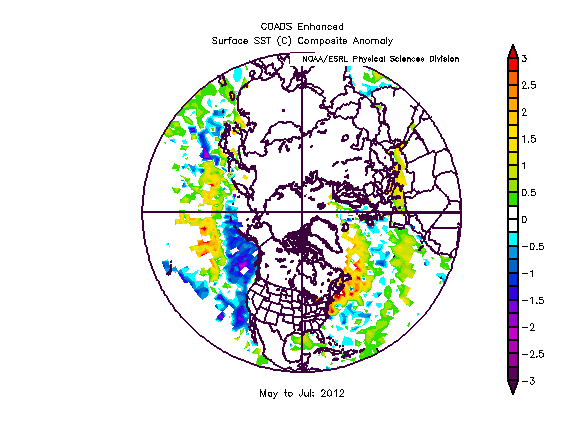 As the MJO comes back around in October, we'll see SSTs warm back up and I'd bet the CFS forecasts do as well. Maybe Adam would post photos of forsythias blooming in January instead? 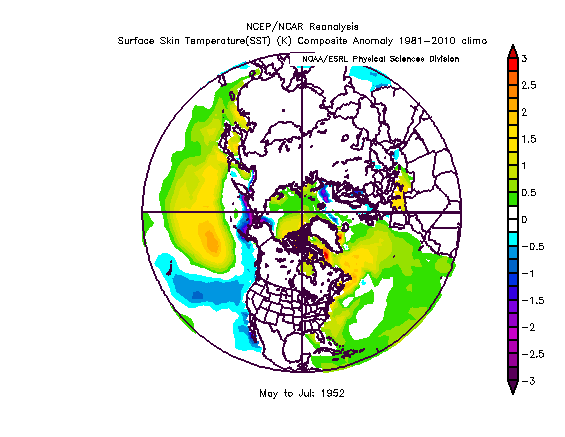 Thanks for posting the info and how the ao/nao & pdo have a hand (and thus increases uncertainty) in all of this. One thing that piques my interest is the activeness of the pattern so far in the "fall squall" season -- it's been a bit more active and stormy compared to other Nino years...the last years that come to mind with as much severe weather (non flooding) in September is 2004 (that was thanks to Ivan & Jeanne) and 2003 (the front after Isabel blew through in mid month). I didn't go to the CDC site to corroborate, but all those ice storms we locally had (and they had places farther to the north) in 1993-4 I believe was a similar set-up. 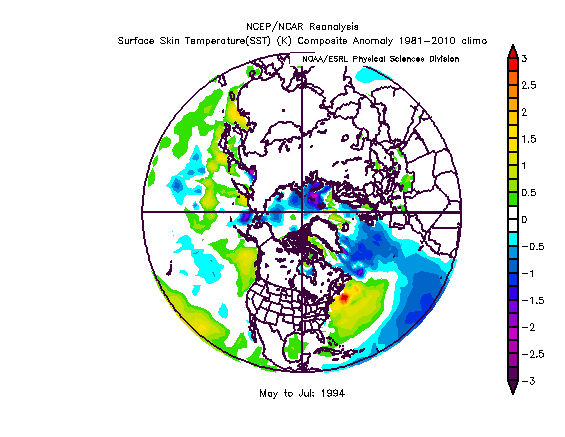 The late JackO Newfoundland pool study would definitely point to a +NAO for this winter, it was bath water from May thru July. 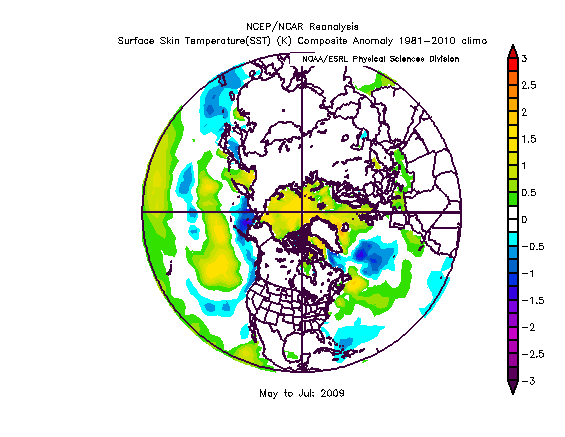 I didn't count recurvatures yet, but am guessing we're in a NAO neutral number based on the Atlantic alone. Tony, long time no talk. 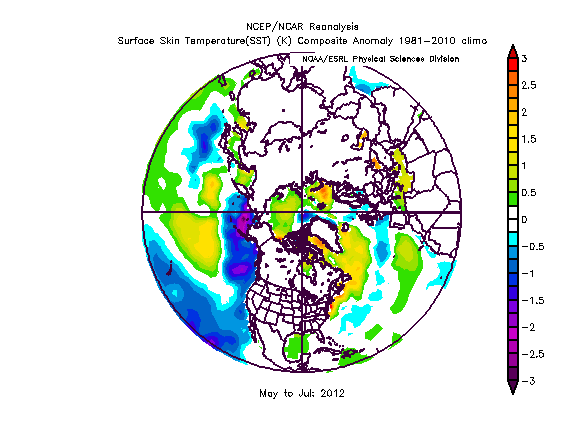 Just to match up with your JackO thoughts, the 2012 UK prediction based on May SST were also suggesting a +NAO. 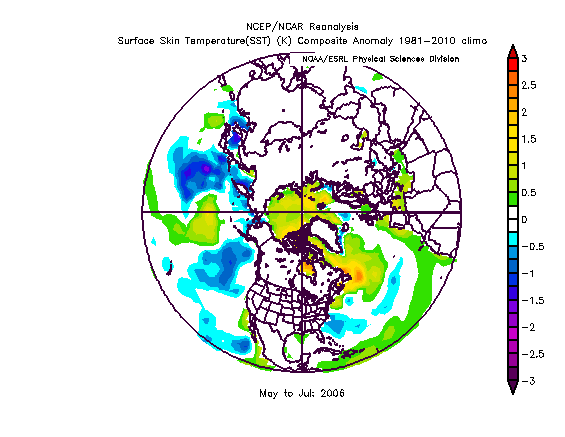 The way things change (climate wise) and knowing how difficult it is to predict the nao this far out I would'nt place too much on these studies,how many times have they been right! Well... a study would seem to suggest its been right more often than not, wouldn't it? We're not talking a "model" which attempts to simulate numerically and therefore could theoretically be wrong all the time. f you look at the past 2 and and a half years temps have averaged a couple of degrees above normal and I know some say that's too short of a time span to judge but the continuing trend and nothing I see changing tells me this is what we can expect from now on. I do believe it will soon be the longest period of time this has happened. Are'nt there studies that state that the ice cover in the northern hemisphere in Octobet I believe, relate to the nao and a cold winter? Thanks for the info that what I was looking for. How are you doing? I didn't realize they were still using it for outlooks, couldn't find it recently. It would be interesting if the Siberian snow cover is above average in October, setting up totally conflicting signals. I would chose the latter over the former, but then I am in a much more easier position than alot of you are with this. Hm, thanks. That's not a good sign for snow lovers with a weak nino in the mid atlantic region. 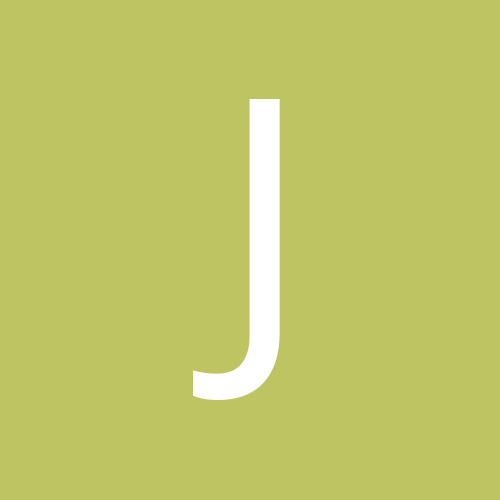 The IRI site updated for the month of September, there is a lessening trend by all of the dynamical and statistical models of el nino for this upcoming winter. At this point I'm more interested as to how the mid and upper latitudes react this autumn than the eventual enso state. Its been posted for us we do ok, sometimes fabulously with a weak nino, but that depends on the nao and I suppose the pdo also. I think the odds probably favor a weak nino even with the cooling that has been taking place in the Pacific. Without a strong nino, I suspect that the pdo will stay negative. The ao and nao are always somewhat of a crap shoot. I'm worried that the ao and nao will again be more positive than negative but this early there is no real way to know. I'll be watching the snow cover and the stratosphere through the fall hoping they show me something that gets me excited. For DC, I'm not a fan of weak ninos. Since 1950 we have done less well than during moderate one and only about 1 in 3 ends up being above normal for snow plus when they do, they so far have not been mega-years in terms of snow. Yeah alot of muscle memory with December's weather (outside of 1989 that is). That's no way to talk to Ray, even if he is going for a warm winter. The funny part of 2006-07 was how bitterly cold that February was...we really paid the price for a warm first half of winter with February and March's sleetfest and all of the cold weather we picked up in February (seven degrees below average at PHL in Feb 07). The flip in the pattern after January 15th was rather awesome and we had a pretty extreme twelve week run after the flip...March and April were pretty whacked as well (St. Patrick's Sleet Storm and then the nor'easter on Tax Day that had snow mixed in across the Philly burbs). I remember a picture of the manayunk area of philly that was on the news in mid april of 2007 that showed about an inch of snow on the ground. I did a quick comparison of previous ensos since 1950 and "the better fits" with this season. I remember Jack saying how strong ensos sometimes do trump this as was the case in 1991 and 1997 when the pool was quite cool. At anyrate, here goes and let the people vote on it.